Kaylin Neya, the Chosen, lives in a house that is a sentient being, able to make any room fit its owner, and offering a defense that only the Pentagon (if this weren’t a fantasy world) could compare. Kaylin has been collecting the lost, or those that are without a “family”, housing them in her home and keeping them safe. Her most recent roommate is Moran, one of her fellow Hawks, but also an Aerian. A race of people who have wings. One day, while walking with Moran to work, a magical assasination attempt is made against Moran. While Kaylin investigates, she is embroiled in an Aerian political scheme, and we learn a lot more about the race that Kaylin has always idolized, than we ever had before. It’s been about a year since Cast in Honor, the last book in this series, came out. I re-read my book review, curious about what I had written. I had enjoyed the previous novel, and I certainly enjoyed Cast in Flight. However, my sentiments that Michelle Sagara could move the plot along a little quicker, and that Kaylin hasn’t evolved too much, is still the case. I truly enjoyed learning more about the Aerian race, it was interesting, if a tad political. However, I did like seeing Moran take steps towards accepting her place in Aerian society. Kaylin, as the Chosen, still seems to be kind of clueless. She is the vessel through which her magic is yielded, but she wears a blindfold, and seems to solve the mystery, vanquish evil, or whatever, completely by chance. I would like Kaylin to start making things happen! Make decisions! Be conscious of the consequences to her actions! Most of the heroines I love, risk themselves to conquer their fears, evil, or whatever, and Kaylin certainly does that. My question is, how will she ever “become” if she doesn’t choose a road? If you are a fan of this series, certainly do read this novel. 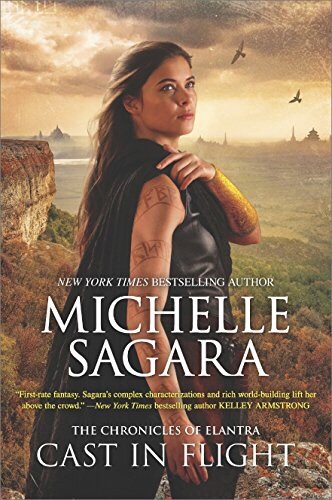 Michelle Sagara is a fabulous writer, however, I’m only giving it four stars because of Kaylins lack depth f growth. Choose a path and become what you are meant to be already. I want to see it happen, but I’m running out of patience. What do you think?